Watch full RWBY Season 4 Episode 6 full HD online. RWBY Episode 46 online for free in HD. Team RNJR is on the road and comes across an abandoned town, which is not marked on the map and seemingly still under construction. After Nora spots a sign with the town’s name, Oniyuri, only Ren has ever heard of its history. He explains that Oniyuri is similar to Vale’s Mountain Glenn, although it was never completed. Richer citizens of Mistral, who were disappointed by the kingdom’s government, tried to make their own self-governed settlement, hoping to create an own kingdom someday. However, Oniyuri was overrun by Grimm before it was completed. Ren reveals that his parents believed in this new foundation. The team agrees on quickly leaving Oniyuri behind. Meanwhile, in Atlas, Weiss sings at the charity concert. Her performance gets her a lot of applause, but Jacques doesn’t even clap. He, Whitley, and Weiss later attend the after party in the Schnee manor. During the party, Weiss is approached by a young man, Henry Marigold. 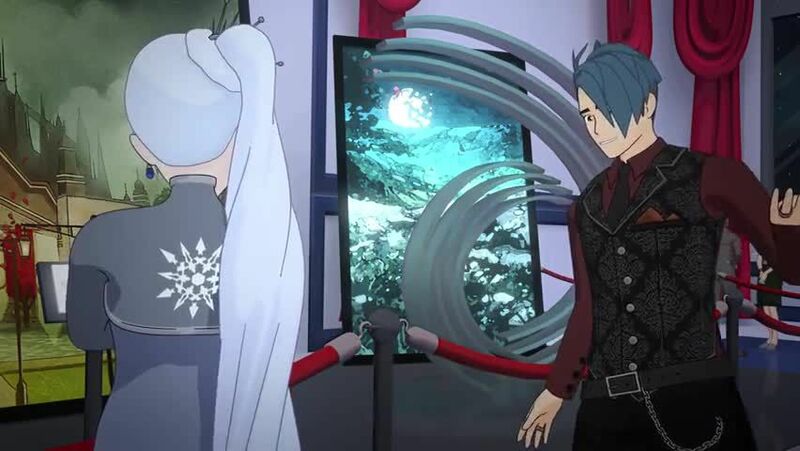 He tries to make advances on her, but after he reveals that he doesn’t even know that he is attending a fundraiser for Vale, Weiss has him leave the party. She then hears people gossiping about the Fall of Beacon, including a woman whose comment on the topic is “good riddance”. The heiress has enough and verbally accuses everyone present of only caring about themselves. Jacques tells Weiss to stop and scolds her for embarrassing the family, but his agitated daughter inadvertently summons a Boarbatusk with her Semblance. The beast tries to attack the gossiper, but is gunned down by General Ironwood. The woman demands Ironwood to arrest Weiss, but he refuses, stating that Weiss is “the only one making sense around here.” Ironwood leaves, while Jacques stares furiously at Weiss. Team RNJR is still in Oniyuri, and Ren somehow senses Tyrian, who, seconds later, ambushes them. Tyrian attacks immediately, taking on one member of the team after another, before stopping to declare his mission to capture Ruby. He also takes a brief interest in Jaune, and takes pleasure from the fact that Ruby doesn’t know why he is after her. During the continued fight, Tyrian dominates the young Hunters and Huntresses. Ruby even powers Nora up with lightning Dust, but Tyrian blocks her hammer with his stinger, revealing that he is a scorpion Faunus. In short succession, he knocks down his other three opponents, and prepares to sting Ruby, whose Aura is depleted. However, Qrow, who transforms from his crow into his human form, arrives barely in time to block the attack.